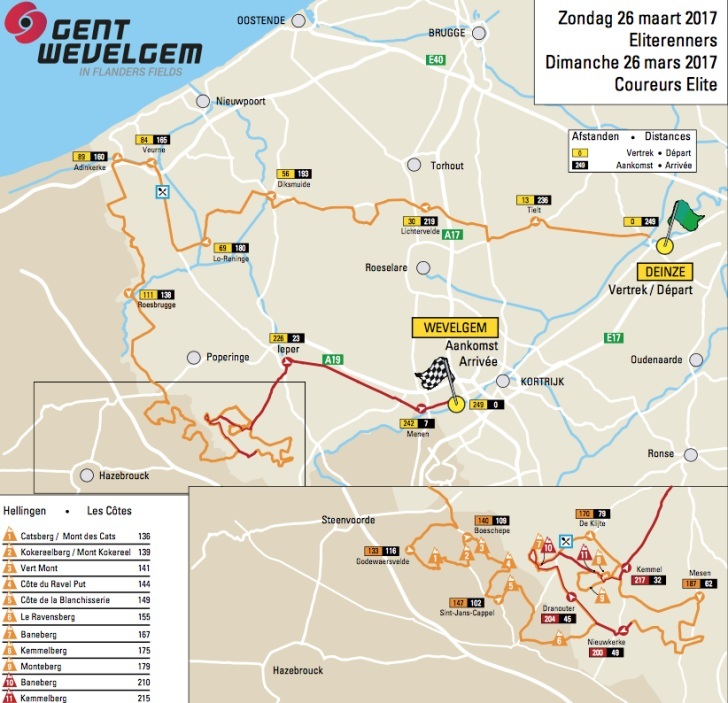 The Belgium trilogy concludes with the longest of the three races, at 241km, but fewer cobbles and bergs. In fact, there aren’t any pure cobbled sectors, but there are three semi-paved/gravel sections or Plugstreets. Traditionally this is one for the sprinters, but in recent years the weather and the break have had a major say in the outcome. Gent? Another example of dishonesty in the names of bike races, as the race has started in Deinze for over a decade. The first 130km are all on the flat with the sole purpose of softening up the legs. They are across open countryside and, as we saw in 2015, if there is even a waft of wind it will make the first half of the race extremely difficult. The riders then dip into France and take on the first climb of the day, the Mont des Cats, short at sharp at only 500m long and 9% gradient, then we have similar climbs in the shape of Mont Kokereel, Vert Mont, Mont Noir, and then the Cote de la Blanchisserie. At 160km the race returns to Belgium and tackles the Baneberg, a 300m, 20% wall. Then the first of two, all be it different, accents of the only cobbled climb of the race, the Kemmelberg, which peaks at 17% and then the Monteberg. We then come to the ‘Plugstreets’, three sections of gravel road. After the last of these there are just over 50km left and two climbs remain. Both have been tackled previously, the Baneberg and Kemmelberg, however, the Kemmelberg will be ridden up the western side, which is steeper and peaks at 23%. After this, there are just over 30km to race over flat roads and we’d expect to see a small group or solo effort time trialling their way to the line. The weather is not due to be horrendous tomorrow, but the wind is set to blow and we know what that can mean for this race. The peloton will be on full alert for any sniff of an echelon. The same mix of riders will be in the hunt for the win as where in the weeks previous two races. Due to the lack of climbs and longer length than the other two, we are tempted to favour the quicker of the classics men. Last year’s winner, Peter Sagan had a race to forget at E3, after missing the vital moves and then having a mechanical. He had a similar experience last year and then bounced back to win both Gent-Wevelgem and then Flanders the following week. His team also have Sam Bennett as a backup, but as the action will be focused on the later stages of the race expect Sagan to blow thing apart on the Kemmelberg, as he did last year. Alexander Kristoff, as we mentioned before, has been off colour and with Flanders a week away he should be showing himself more in this race. His teammate Tony Martin is wearing the leaders dossard for this race, his target is Roubaix – so the challenge for both will be who can keep pace with the attacks on the Kemmelberg. We’re not sure if either of them can. Quickstep have really owned this week in Belgium. They will hope that either Tom Boonen or Fernando Gaviria can continue that here. Boonen especially has looked like he’s holding something special back, perhaps for Flanders and Roubaix. However, the one rider who can keep on Sagan’s wheel on an attack would be Zdenek Stybar, who has been in great form but has been out shown by Gilbert. They will be able to cover the attacks and have options for all eventualities. Another podium will be a minimum. Greg van Avermaet looked in ominous form with his win at E3 and another win is on the cards here. What we haven’t really seen yet is he and Sagan going toe to toe on a climb like the Kemmelberg. Expect this to happen today and it should be fantastic, as these are the two stand out favourites for Flanders next week. Oliver Naesen has been Mr Consistent so far and showed great guts to go for broke by sprinting from far out at E3. He again should be looking for another high placing and with Alexis Gougeard back in the squad AG2R have two great young classic prospects to play with here. Trek-Segafredo hasn’t had a great week, but they have thier A team here for this race with John Degenkolb, Jasper Stuyven, Edward Thuens and Fabio Felline as options for them. Degenkolb will be the leader as he looks to build towards Roubaix, but arguably Stuyven and Felline should go better on the final climbs and chase down the attacks. Thuens will be saved as a second sprint option. Sky have again Luke Rowe and Ian Stannard. Rowe missed the move in E3 but still looks the better of the two at present. They will both want to put in a strong show in what has been a disappointing week so far them. Gor outsiders, we’d look for Arnauld Demare, he missed E3 and will be fresher, but don’t think he can cope with the fierce attacks late on in the race. Another rider who missed E3, Jens Debusschere, had a bad defence of his Dwars door title and will want to make amends here. Our Pick: Peter Sagan. Predictable and dull, but after his poor E3, it feels like it’s shaping up to be a lot like 2016 and we all know how that played out over the next few days!